And Here We Go! : My Interview with Jim Weiss! My Interview with Jim Weiss! A little while ago, I received an email from Jim's wife, asking if I would be interested in talking a little bit about Jim's recordings on my blog. She would send me some free CDs to listen to, and if I liked them, I would write about them. Standard blog review. No biggie. But, this wasn't 'standard.' This was JIM WEISS! This was the man with the golden voice who guides my sweet girls into Sleepytown each night with his stories of Greek myths and Shakespeare. We've been listening to Jim Weiss for years! Click here to read one of my first blog posts, which happens to be about Jim Weiss! So, I said no thanks, I already know who he is, and I certainly don't need any of his CDs, especially for free. You better believe that I emailed his wife, Randy, back as fast as I could and said YES! I did, however, ask for an interview. I wanted to talk with Jim Weiss! Well, honestly, I was too scared to actually ask to talk with him over the phone (because, he's like homeschool royalty, and the thought of actually speaking with him made me have a panic attack! ), so I asked for an email interview. They were happy to oblige, because, well, it's Jim Weiss. Can you even imagine him being anything but accommodating and pleasant and comforting? Yeah, me neither. I asked for questions from you on one of the Classical Conversations Facebook pages, and y'all came up with some great ones! I added a few, too, and emailed them to his personal email address! Chills! AHWG (that's me): Many Classical Conversations families like mine listen to Story of the World. How long does it take to record an entire book? Did you do it chapter by chapter? Jim: When I record a full-length book, I begin by reading it and making notes regarding pronunciation, how to deliver certain lines (“he said angrily” calls for an angry tone.) I will often record for three to four hours. When I start to feel a bit of fatigue, or hear fatigue in my voice (even if the listeners wouldn’t detect it,) I stop recording and move to editing. So I read multiple chapters at a time. AHWG: Which was your personal favorite SOTW book to record? Which did you learn the most from? Jim: I learned new information in all four volumes of SOTW, especially regarding African and Asian history. Although I already knew a good deal on my own, there were a few individuals, and even empires, about whom I knew very little. So reading Susan’s books added to my own education. Conversely, there were a few times when I called Susan to question a fact. If I proved to be correct, we talked over what I would say, and she would use that wording in her next print edition. Even with a deservedly renowned historian such as Susan, another historian serves as a useful back-up. AHWG: I have two young daughters, ages 4 and 6, and we're also an American Heritage Girl family. I was thrilled to purchase your AHG stories this year! How did you get involved with American Heritage Girls? Jim: Some AHG families were Jim Weiss fans, and they told us about the organization. We contacted AHG, and the upshot was a special project on which I told the story of AHG’s founding, followed by the stories of the historical figures with which the different levels for AHG girls are connected. AHWG: Do you write some of the stories (or versions) yourself? What is that process like? Jim: Most of the recordings I have done over the last 25 years have been in my own words – though I’ve recorded about 30 books right off the printed page. In general, though, I’m reading from my own script. I used no script for the first dozen or fifteen Greathall Productions recordings, however; I just sat in front of the mic and told the stories a few times until I liked what I heard. When I perform in concert, I follow no script, even if I used one in recording the story, so that each performance is a little different. It keeps the material fresh for me, and I think listeners can feel that difference. When I write a script for a recording, it may take only a few days, or it may take twenty versions, and in a few cases, I worked off-and-on for several years trying to find the right approach to the story. AHWG: What was the longest you've worked on a recording? Which one was it? What's the average time it takes to record a CD from start to finish? Jim: I just finished a collection of stories in less than a week. On the other hand, it took four attempts over four years to find the right way into the stories on “Galileo and the Stargazers.” But that’s unusual. Recording a book, using the author’s unabridged text, may take a month in the studio, as I record, edit and master the recordings myself. AHWG: Can you tell us a little about your studio and the recording process? Jim: You can see photo’s of the studio at http://www.greathall.com/photoalbum/studio.html. It’s across the driveway from our house in Virginia, with a view into the woods. There is a recording booth, a room with lots of bookshelves in which I write, a powder room and a small kitchen. We designed the booth for spoken word, rather than for multiple speakers/singers/musicians, and it works perfectly for what I do there. AHWG: We have every Greek mythology CD; it's one of my oldest daughter's favorite subjects. Which is your favorite Greek myth to tell? Jim: I, too, love Greek mythology, which explains why I have three recordings so far. As for favorites, I frequently tell Hercules stories in “live” shows. Perseus and Medusa, which was about 20 minutes long when I recorded it in 1989, has grown into an hour-long live presentation with many levels that all connect in the end. My other favorite, and one of my three or four favorite stories in the world, is the story of Theseus, which is not only a great adventure but is also a teaching tale. I have spent decades exploring that one, and I don’t expect I’ll ever be done with it. AHWG: How did you get into story telling? Who inspired you when you young? Did you want to be a story teller when you were growing up? Jim: My father told us stories from literature and history when I was a boy. My mother read aloud to us. My grandfather had a repertoire of half a dozen stories we knew so well that we grandkids would chime in on certain phrases. They all inspired me. AHWG: Do you have any advice or suggestions for young adults interested in becoming story tellers? Jim: Read, read, read! Listen to (and sometimes watch) other people whose style and content resonate with you, and try to figure out what it is that you like. Then try it yourself. If you do this correctly, you will not come out as a clone of someone else; instead, you will incorporate certain element into your own style. AHWG: What is your personal, absolute favorite, not-to-miss CD recording or story? Jim: My wife, Randy, thinks that any Jim Weiss/Greathall collection must include “Animal Tales” and “Galileo and the Stargazers,” and I never argue with my wife. AHWG: What story have you always wanted to tell but haven't yet? Jim: There are MANY I haven’t yet told, and I hope to get to as many as I can. The order in which I record them depends on when the characters “tell” me that they are ready to be heard. AHWG: Can you give us the inside scoop on upcoming recordings? Jim: There will be at least two (maybe more) recordings coming in autumn, 2014. One is a collection of wonderful stories for young listeners. The other(s) will be history recordings. We are still confirming what the subject might be. Jim: I have cracked myself up on more than one occasion when I improvise a funny phrase. When I recorded “King Arthur,” I did not have a long enough clip of crackling fire sounds, and as this was before digital recording, we ran tape loops over the furniture over and over in the studio while recording onto another player. AHWG: What's one thing you'd like my readers to know about Greathall Productions? Jim: Every Greathall recording is built on classic literature or history, and every recording has an ethical underpinning or we just don’t do it. I have turned down materials from a few top authors because my wife and I felt that the books crossed one or another line, because our listeners count on our choosing material appropriately. AHWG: Finally, to what do you attribute your success? Jim: Everybody loves a good story. Stories are the vehicle by which we learn the fundamental wisdom of our civilization and our families, and a powerful way to learn how people think and feel so that we can better interact with one another. Ad for my own success, I’m doing what I’m supposed to be doing, using the gift(s) I was given, for my family’s pleasure, but also to bring good stories and good teachings into the world for millions of people around the world. We feel very blessed to have this opportunity. We really do LOVE Jim's recordings and have been listening to Greathall's stories for years! They have a bunch of American History CDs and mp3s available now, just in time for CC's Cycle 3! Click here to check those out! And if you're looking for something in particular, click here to check out their curriculum guide by subject, including G.A. Henty titles. Nice! I'd like to thank Jim and Randy Weiss for being so kind and talking with me. Jim is just incredibly humble and gracious, and I'm still just star-struck that Jim Weiss actually talked to me! While I've gotcha here, let me just give a shameless plug to my other blog, Usborne Book Barn! In one of my latest posts, I share how you can score 23 Usborne books (the Cadillac of books!) for about $3 each! Click here to check it! And finally, in other news, my sweet Anna is having her first major operation this Tuesday. Her right kidney has been having issues for a while now, so the doctors are going to try to save it by removing her ureter and reattaching it to her bladder (I think). Please pray for us, and I'll keep you updated! Thank you so much! 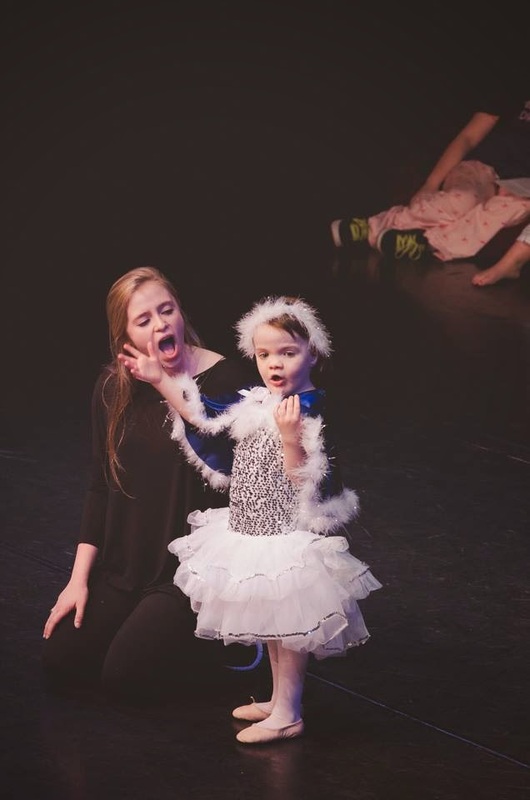 This is Anna with her helper, Lauren, at her dance recital last month. They sang 'Let It Go' together as a special solo during the recital! Yep, adorable, memorable, and not a dry eye in the house. Mommy and Anna after the show (tears and all). Lauren gave Anna her very own (and very big!) Olaf! Thanks, girl! I hope you all had a fantastic Independence Day, and I'll try not to stay away too long this time. ;) You can always find me on Facebook here and at my other blog's fb page. Great article! We also love Jim Weiss and it was fun to hear, I mean read, an interview with him! Praying for Anna and her wonderful mom! Great interview! How fun that they contacted you and that you thought to ask for an interview =) I don't think I would have thought of that. I'm going to look into some of those American History recordings!